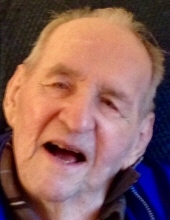 Thomas Henry Enright, formerly of Hamden, passed away peacefully on January 25, 2019, surrounded by his family. He was 93. Mr. Enright was born on 11/22/25 in West Haven, the son of Ilka (Buehler) Enright and Thomas Enright. Mr. Enright was a decorated WWII veteran and a proud American. He served his country by joining the Navy when he was just 17 years old. He was a turret gunner with the Navy’s torpedo squadron #86, which operated off the aircraft carrier USS Wasp. He fought in active combat against the Japanese. He received numerous honors, most notably the Air Medal. Mr. Enright was married to Joan Claire (Thorpe) Enright for 55 years until her death in 2003. They met on a blind date, married in 1948 and made their home in Waterbury and then Hamden CT, where they raised their three daughters. Thomas was a devoted husband and family man. He was a loving, involved and supportive father to his three daughters throughout their lives. Mr. Enright was a construction supervisor for the Southern New England Telephone Co. for most of his life, retiring in 1987. He had a great sense of humor and an always positive attitude. He was interested in current events and politics. Even into his 90s, he kept up to date on happenings around the world and always had an opinion on everything. He leaves his daughters, Cheryl Enright and her partner Ralph Sullivan of Boston, MA, Patricia Hamilton of Fort Hill, SC, and Joan Klics of Beverly, MA. He also leaves four grandchildren, Carlye Haverkampf and her husband Clint of Clinton, Kristin Hamilton of Hamden, Mary Beth Klics of Malden, MA, and Thomas Klics of Magnolia, MA, and his two great-grandsons, Declan and Darren Haverkampf of Clinton. Friends are invited to attend a Mass of Christian Burial celebrating Mr. Enright's life at St. Joan of Arc Church, 450 West Todd St., Hamden on Wednesday, January 30 at 10:00 a.m. Interment will take place in All Saints Cemetery. To send flowers or a remembrance gift to the family of Thomas H. Enright, please visit our Tribute Store. "Email Address" would like to share the life celebration of Thomas H. Enright. Click on the "link" to go to share a favorite memory or leave a condolence message for the family.